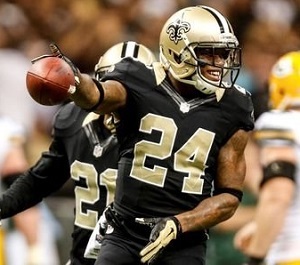 Corey White, CB, Saints (NFL) — In a Sunday night primetime meeting that was hyped as a guaranteed shootout between the Saints and Packers, one team actually decided to play defense. With Green Bay going for a go-ahead touchdown in the third quarter, White tipped an Aaron Rodgers pass near the goal line that was intercepted by linebacker David Hawthorne. That set up a New Orleans touchdown, and they never trailed after that in a 44-23 victory. In the fourth quarter, White added an interception of his own. Ronald Martin, SS, LSU (NCAA) — “Only three things can happen when you pass, and two of them are bad.” Woody Hayes coined the phrase, and it has lived on through every football coach reluctant to embrace a pass-heavy offense. Perhaps those words traveled through the mind of Ole Miss coach Hugh Freeze following his team’s 10-7 loss to LSU on Saturday. Ole Miss was setting up for a game-tying 42-yard field goal try in the final seconds when a delay-of-game penalty backed them up five yards. After LSU called timeout, Freeze got more time to think and decided to run one more offensive play … and that resulted in Rebels QB Bo Wallace’s pass being intercepted by Martin at the one-yard line. Before the game-sealing INT, Martin, a senior, had five tackles and one forced fumble. Miami Dolphins (NFL) – It was a group effort by the Dolphins’ secondary to give Jaguars rookie QB Blake Bortles a tough learning experience in Sunday’s 27-13 Miami win. Free safety Louis Delmas had an 81-yard interception return for a touchdown and a fumble recovery; strong safety Reshad Jones had a team-high eight tackles and one sack; and cornerback Brent Grimes had a 22-yard pick-six. Jonathan Jones, CB, Auburn (NCAA) — The Tigers survived an upset bid by South Carolina and are still in the national championship playoff mix thanks in large part to Jones’ two fourth-quarter interceptions in the end zone. The junior corner’s second takeaway came on the game’s final play, preserving Auburn’s 42-35 win over the Gamecocks. Chris Harris, CB, Broncos (NFL) — On Thursday night, Harris recorded four tackles, one pass breakup and one interception in Denver’s 35-21 win over the Chargers. Then he left the stadium to take his wife to the hospital, where she gave birth to their daughter on Friday. That’s a good week, and he didn’t even have to work the weekend. Antonio Cromartie, CB, Cardinals (NFL) — Before this season began, surely nobody thought Eagles-Cardinals would be the biggest game of Week 8. But with both teams going in at a surprising 5-1, it earned marquee status. Cromartie was the defensive star in Arizona’s 24-20 win, collecting two interceptions, five tackles and three pass breakups.